We have been blessed with English Cocker Spaniels for almost 20 years now. They run our lives, share our home and rule our hearts. 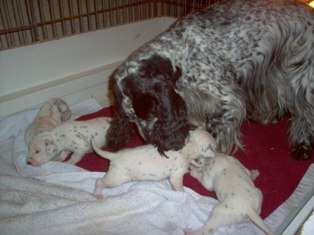 We have litters occasionally, which we prespoil and sell to a very select group of people. 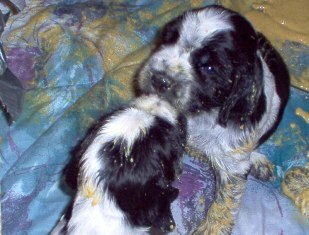 The English Cocker Spaniel is a merry little hunting dog that will worm their way into your heart, home and hearth. They hunt for food in your pockets, purses and behind every door. Those that want to hunt something bigger, they are excellent bird dogs. They flush and retreave, are happy to do it just as long as there is some sort of goodie waiting for them at the end of the day. This "goodie" is more often than not, you. Come see us and our herd of "furry kids" - we alway have more than enough around to give out wet kisses, cold nose bumps and hugs from everyone and for everyone. This is Rose (Winauby's Exotic Tango) watching over the Dalmatian Puppies. Does not matter whos puppies, if they need cleaning, Rose is your girl. She is a Great Grandma and loves all puppies.